Malnutrition is one of the most serious nutritional diseases among children especially during the weaning period. 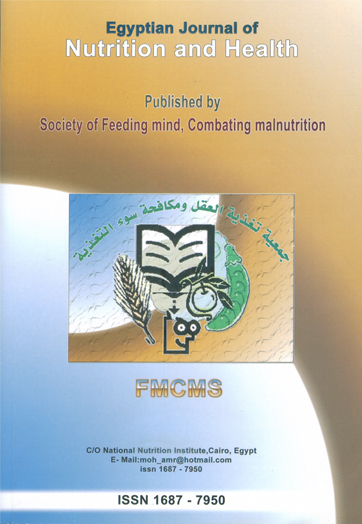 Ten weaning-food mixtures were prepared by using faba beans (Vicia faba L.) variety Giza; rice (Oryza sativa); corn (Zea mays) variety 320; lentil (Lens culinaris) were obtained from Agricultural Research Center, Giza, Cairo. Meanwhile, karish cheese (Cottage cheese); apple (Malus domistica) and Yellow carrots (Daucus carrota) were obtained from the local market, EI-Obour City, Qalubia, Egypt. Chemical composition of food materials (g/100g on dry weight basis) indicated that: karish cheese powder recorded the highest percentage of protein (31.6%) followed by lentil (26.2%), faba bean (24.5%), respectively. Meanwhile, carrots showed the highest percentage of crude fibers (6.9%), followed by apple peel (4.0%). Rice had the highest percentage of carbohydrates (88.5%). The highest value of calories was found in corn (411.5 kcal), followed by rice (401.7 kcal). Cereals are rich in carbohydrates and are the main source of energy. Moreover, consuming 100 g from any of the ten prepared formulae could cover the daily requirements for infants (6 — 12 months) from proteins and about half or more of the required energy according to FAO/WHO, (1989), which recorded that babies need from (13 — 14 g) protein and (650 — 850 kilo calories). Total bacterial counts of all formulae mixtures ranged between (31 and 61), while psychrophilic bacteria ranged between (22 and 44). Microbiological evaluation showed that all formulae were in the permissible limits according to the recommendations of Egyptian Organization for Standardization and Quality Control. Also, results showed that the total bacterial counts were less than 1000 cell/g in all formulae. Coliform bacteria, fungi and yeasts were not detected in all samples and had a negative presumptive test for the presence of coliform bacteria, fungi and yeasts. These results may partially be due to the effect of heat treatments during the preparation of mixtures and mainly due to heat sterilization of final food mixtures.